Prepare your family for flooding (FEMA “Know Your Risks” brochure). Do not walk through flood waters. Pay attention to barricades. Don’t ignore them by driving past them. 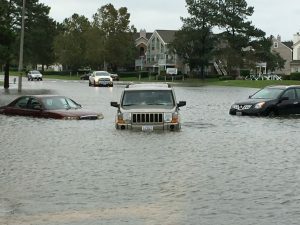 The average automobile can be swept off the road in 12 inches of moving water, and roads covered by water are prone to collapse. Attempting to drive through water also may stall your engine, with the potential to cause irreparable damage if you try to restart the engine. If you come upon a flooded street, take an alternate route. Know the affect of the different categories of hurricanes to the area you reside.